Microbrew dropouts, go back to wine school! That was just fun to say, but don't worry—there'll be craft brew, too, on Swirl's third-edition, back-to-school wine quiz. Answers below. No peeking! 2. True or false: The beautiful, historic Fountaingrove Winery in Santa Rosa was destroyed by the Tubbs fire in 2017. 3. Which of these wines is identified incorrectly? 4. True or false: The 1976 Paris Tasting was not the first time that California wines bested European wines in a competition. 5. Geek alert! What's 777 on 101-14? A) Twist on the French 75 cocktail from 101 North Brewing Co.
6. 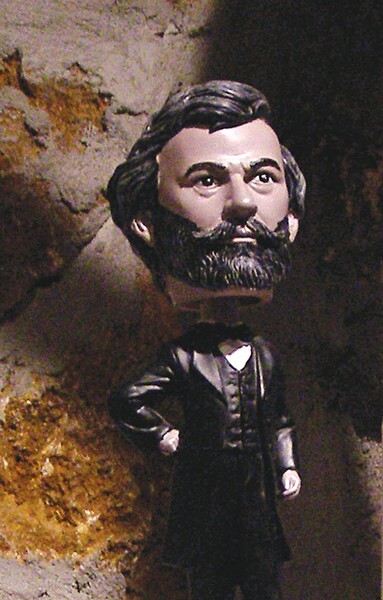 Picture round: Who is the founder of Buena Vista Winery represented in this bobble head figure? The (French/Italian) grape Aglianico, which makes a (deep red/fruity white) wine, was reputedly prized by the (Romans/kings of Burgundy). 8. Which one is not like the others? D) Beers made by Fogbelt Brewing Co.